From 0.0.0.0 to 255.255.255.255, IP version 4 addresses are mathematically finite and as I’m sure you’ve heard or read about, they are running out. (Follow the countdown on Twitter.) It’s quite apparent because we’ve reached that sensationalist level in the mainstream media. Rest assured, a solution is in place and plenty of people are working behind the scenes to make the transition as quickly as possible. The solution is called Internet Protocol version 6 or IPv6. What is it? What’s different about IPv6? Will we have to go through this again when IPv7 comes out? What happened to IPv5? All your questions answered in this article! Meanwhile, the Internet Society is coordinating major websites like Google, Facebook, Yahoo!, Akamai, Limelight Networks, and possibly others to run their web content over IPv6 on June 8th, 2011. This event is becoming known as World IPv6 Day. On 8 June, 2011, Google, Facebook, Yahoo!, Akamai and Limelight Networks will be amongst some of the major organisations that will offer their content over IPv6 for a 24-hour “test drive”. The goal of the Test Drive Day is to motivate organizations across the industry – Internet service providers, hardware makers, operating system vendors and web companies – to prepare their services for IPv6 to ensure a successful transition as IPv4 addresses run out. Today, Google announced on the Official Google Blog that they would be participating while also providing background details of IPv6. Beyond that history, the rest of this article will provide resources on the technical basics of IPv6. IPv4 is the fourth version of the Internet Protocol and is the revision we are all familiar with. It gives you an IP address like: 192.168.1.1. With the number of available IPv4 addresses set to run out this year, the urgency of successfully implementing IPv6 is ever increasing. 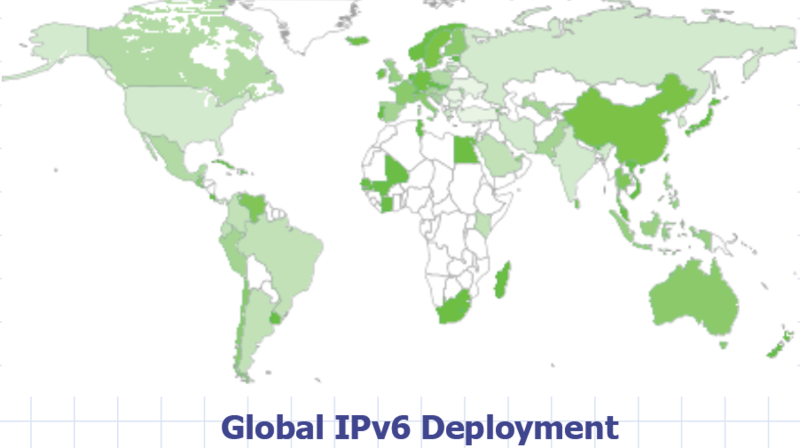 Is The World Ready For IPv6? Here are the alarming results of a survey of IPv6 readiness of a ton of different organizations like universities and private partners. Google info announced back in May 2008. – If you run IPv6, you can access it at ipv6.google.com. YouTube follows suit and transmits data over IPv6 to Google over IPv6 partners in February of 2010. In June, 2009, the Netflix website and the instant streaming became accessible over IPv6 with a big part of that being their Content Delivery Network, Limelight embracing IPv6. Comcast was set to begin a series of trials in January, 2010 of providing customers IPv6 addresses instead of IPv4. AT&T has been on-board with the White House Office of Management and Budget’s requirement that civilian agencies adopt and support IPv6 in their networks by June 2008. Verizon also did residential trials on IPv6 support in April, 2010. By December of last year, they established a Verizon IPv6 Transition Professional Services group to help organizations transition to IPv6. Sprint deployed IPv6 support in June 2010 to businesses and partners. For more details and testing your connection, you can visit www.sprintv6.net. OpenDNS has had IPv6 on its roadmap for a long time. The Beijing 2008 Olympics were streamed over IPv6 at http://ipv6.beijing2008.cn/en. No-IP uses IPv6 on their nameserver clouds and will increase IPv6 support this year. Facebook will participate in World IPv6 Day. They have offered IPv6 Facebook since last summer at www.v6.facebook.com. NetworkWorld has an article from February last year on where some other web giants stood regarding IPv6 including: eBay, Yahoo, Microsoft, Wikipedia, and Twitter. Amazon is another Internet company that would be interesting to know how they’re progressing with IPv6. Microsoft implemented production level IPv6 support with Windows Vista. Previously, Windows XP and its service packs went from developer preview to production level in SP3. Apple enabled IPv6 support by default in version 10.3 Panther of Mac OS X in 2003. For hardware vendors like Cisco, Dell, HP, IBM, and others, the InterOperability Lab and the IPv6 Consortium has worked with them to assist them pass an interoperability and conformance test. By passing these tests, the vendors can bear the IPv6 Ready Logo. From the Wikipedia article on Internet Stream Protocol, IPv5 is not a successor of IPv4 but was part of an experimental protocol that happened to use 5 as the value in the Internet Protocol version number of its packets. It was never referred to as IPv5. The Internet Stream Protocol (ST and later ST-II) was a family of experimental protocols first defined in Internet Engineering Note IEN-119 (1979), and later very substantially revised in RFC 1190 (ST-II) and RFC 1819 (ST2+). ST and ST-II packets carried the experimental non-IP real-time stream protocol. Although this protocol family has never been introduced for public usage, many of the concepts available in ST were similar to later Asynchronous Transfer Mode protocols and can be found today in Multiprotocol Label Switching (MPLS). Will there be an IPv7? With 300 trillion-trillion-trillion addresses, we won’t face the looming countdown of available IPv4 addresses like we are now but there may be a transition to a new version of the Internet Protocol for technological advantages sometime down the road. Just speculating here, I believe that will be a far smoother transition due to its less pressing demand and the thought put into IPv6. Even ping is ready for IPv6, are you? -f Set Don’t Fragment flag in packet (IPv4-only). -v TOS Type Of Service (IPv4-only).